A second man has been charged with the murder of a teenager who was stabbed in a Birmingham park. Abdullah Muhammad, 16, was found injured in Sara Park, Small Heath, and died at the scene on 20 February. West Midlands Police said Amari Robinson, from Birmingham, had been charged with murder and two counts of robbery. He is due in court next week. Demille Innis, 19, from Walsall, has already appeared in court charged with the student's murder. Mr Innis, of Pugh Crescent, is also accused of robbery and possessing an offensive weapon in a public place. Police said Mr Robinson, also known as Amari Tullock, was arrested in Lincolnshire on Monday. He is due to appear before Birmingham Magistrates' Court next Monday. 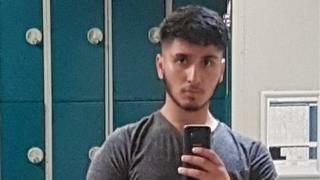 Abdullah, from Lindale Avenue, Hodge Hill, was stabbed in the back and chest. West Midlands Police said his family was devastated by his "tragic and untimely death".